Once a reasonably popular service that allowed you to travel overnight from London to Scotland and Cornwall (also some went Fishguard). Motorail was the ability to drive your car to the likes of Euston, you then board the train to Scotland overnight while someone would put your car on to a specially designed wagon and you would be reunited with your car for your holiday around Scotland. The same services operated to the West Country. Why did it stop? Usage on many routes had declined by the early 1990s. 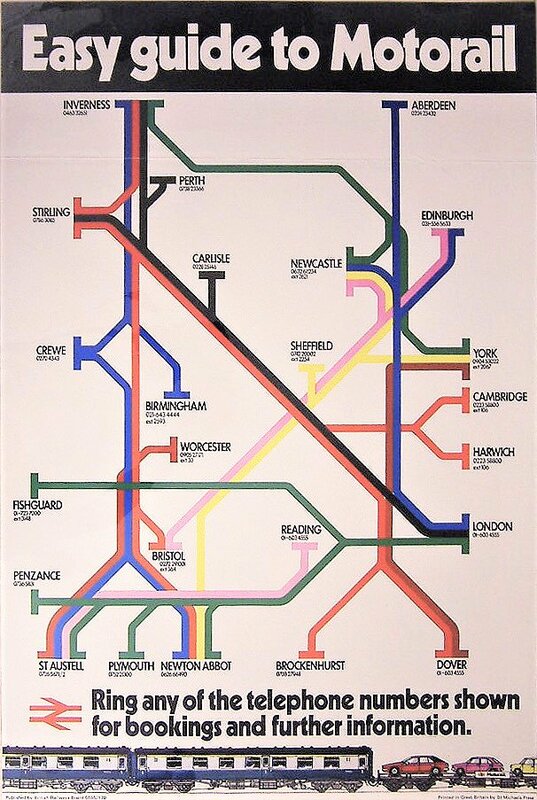 In 1989 the London to Stirling service was discontinued. The services operated at a significant loss and the service ceased in 1995 when British Rail was privatised. First Great Western relaunched a service from London Paddington to Penzance as part of their Night Riviera overnight sleeper service in 1999, but withdrew it at the end of summer 2005. There is no doubt that privatisation also contributed to the end of Motorail. So will we see he likes of Motorail again? Not likely. After all car hire firms offer cheap rentals and the insurance and cost of taking your own car on Motorail were quite high. Plus there is a wear and tear factor on your car doing say 1000 miles around the Scottish highlands. Sadly I cannot see a Motorail service ever being reintroduced. That said is there a scope for a Rail-Drive? After all we have fly drive when going to the USA. In April 1963, British Rail set up an express registered parcel deliver service to compete against the General Post Office; the service was known as “Red Star”. a service which used passenger trains for transporting parcels between passenger railway stations throughout the United Kingdom, owned and operated by British Rail. Senders could despatch their consignments to selected stations at which the parcels were collected by the recipient. The service used scheduled trains, and as such, was one of the fastest methods of transporting a package long distances around the country. This is a very good idea, let’s face it the Royal Mail as it was really good but now it’s pretty poor (oh yes another privatised industry). Looking at the premise, a door to door service that used normal train services to transport the parcel with the guards or in the guards vans to get them to their destination where you could collect the item. I have been writing this post on and off for about two or three months so imagine when I found this thread on Railforums it hit a chord with me. If Amazon were to use the likes of the class 769 and the local “Red Star” type facilities to deliver large quantities to strategic location where they can go onwards with local delivery. This would be a really good way to lower emissions on large lorries around the country. Imagine: Reduction in lorries for say Royal Mail, Amazon, Stobart and the likes would lower emissions. Local train services could be used again to transport goods. One of the problems is that all the new stock has forgone the Guards/brake vans areas so what can you use? Locked out drivers cabs? Will there be staff on platforms to recover goods from the train if there are only a few items? These are all reasonable logistics that with careful planning could be worked out. Maybe even the return of the old BR Brutes?